In her four-year term as Victoria’s Poet Laureate, Yvonne Blomer has spoken truth to power and reinforced the crucial role of poetry in public life. From “I Confess We Ate Chocolate” (read for City Hall the day after Trump’s election) to the moving and elegiac “Blue Bridge Blues” (written in concert with fellow writers sharing memories of the Johnson Street Bridge), her work has enriched our understanding of events both near and far. Join us for an evening of reading and mingling as we toast Yvonne in the last month of her tenure as Poet Laureate, and our city’s robust poetry community. David Wood is a pioneer of Canada’s artisanal food movement, enticing eaters from around the world with his Salt Spring Island Cheese Company. Three decades after the classic David Wood Food Book, he returns this fall with David Wood Cooking for Friends, a tempting and accessible collection sure to become a new favourite. From savoury Leek and Stilton Soup to the splendidly named Spaghetti Wonderful, these recipes will delight your friends—and maybe even earn you some new ones. Take a break from the mall this Black Friday weekend and get your copy signed by the author! He’s ba-ack…Get ready for another evening of Knox-ious entertainment as Victoria’s best-loved columnist launches his third collection, On the Rocks With Jack Knox. Enjoy Jack’s quirkiest and most compelling human interest stories, from the world’s last speaker of Nuchatlaht to the Port Angeles customs inspector who caught the Millennium Bomber. Gathered for the first time in one volume, these true tales of remarkable (if not always admirable) Islanders will spark conversation for years to come. We expect a full house so plan to arrive early for a good seat! Al Purdy was famous for bridging the gap between working class readers and the ivory tower of poetry, celebrating our vast and complex country all the while. Now, on the eve of what would have been his 100th birthday, fellow Canadian poets from all walks of life have come together to honour “Canada’s unofficial poet laureate.” Featuring poems by Lorna Crozier, Bruce Cockburn, Sadiqa de Meijer, and Patrick Lane (to name just a few), Beyond Forgetting is an unmissable collection for any Can Lit enthusiast. Join us for an evening with contributors Doug Beardsley, Nicholas Bradley, Linda Rogers, and Christine Smart, and special guest appearance by publisher Howard White as they remember a poetry legend. Make way for three of the Island’s finest writers, whose new collections frame love and loss in ways both mythic and intimate. In Minerva's Owl, Nanaimo’s Carol Matthews sets out to discover what bereavement means to her after the loss of her husband. Meanwhile, God of Shadows introduces a whole new host of earthy, wry, and delightful deities from poetry legend Lorna Crozier. And in Amateurs at Love, Patricia Young sidesteps the epic for subtle, closely observed poems set in the space between lovers: that charged, mysterious distance so many of us strain to close. Sip, nibble, and make connections at a thought-provoking triple launch. Trade screen time for face time (well, masked face time) with Instagram poetry sensation Atticus. His new collection, The Dark Between Stars, continues the “soft summer love song” of Love Her Wild with moody and romantic vignettes about wine, sunsets, jazz clubs, and the delicate dance between light and dark that keeps the world in motion. Don’t miss out! Patrick DeWitt is one of Canada’s most prominent young novelists. Best-known for his blackly funny western, Sisters Brothers (soon to be a film! ), he trades grit for foie gras in French Exit, a “tragedy of manners” that riffs on high society in New York and Paris. With a refreshingly dark take on the world’s most romanticized city, the story of a mother and son mired in scandal, codependency, and metaphysical lore promises to be the most demented novel you’ll read all year. Join us for an evening of conversation with a truly original talent. She’s a celebrated author and mother who brings the wisdom of her Cree, Lakota, and Scottish roots to everything she does. Now, the award-winning Monique Gray Smith returns with the sequel to her semi-autobiographical 2013 novel, Tilly. In Tilly and the Crazy Eights, the title heroine finds herself on the road with eight elders as they journey to Albuquerque for the Gathering of Nations Pow Wow. Sparkling with humour, pain, hope, and resilience, their story will open eyes to the richness of First Peoples culture and the challenges that lie ahead. With an author who doubles as an international speaker, this is sure to be a powerful launch. We can’t wait! This fall, explore two very different takes on marriage by local authors known for their wisdom and sensitivity. The winner of this year’s Great BC Novel Contest, Bill Stenson’s Ordinary People follows a couple who lose their dog one hot summer day in 1971 and find something far more mysterious—and devastating. Across the pond, Kathy Page’s Dear Evelyn follows one British couple through their dramatic WWII romance to the subtler struggles of lifelong partnership. Don’t miss this double launch by some of our very best novelists. Join internationally renowned authors and environmentalists David Suzuki and Peter Wohlleben for a unique celebration of the natural world. Moderated by CBC's Gregor Craigie, this special event is a rare opportunity to see the two master storytellers together in conversation. Sharing the stage for the first time, the duo will offer insight into the wonders of old growth forests, questions about society's changing connection to nature, and thoughts on our shared future. Both authors have written numerous books about the natural world, including the acclaimed The Hidden Life of Trees and The Inner Life of Animals (Wohlleben) and Tree: A Life Story and The Sacred Balance (Suzuki). They can speak to the role art can play in activism and the potential for literature to create lasting change. A Q&A and book signing with the authors will follow the main event. 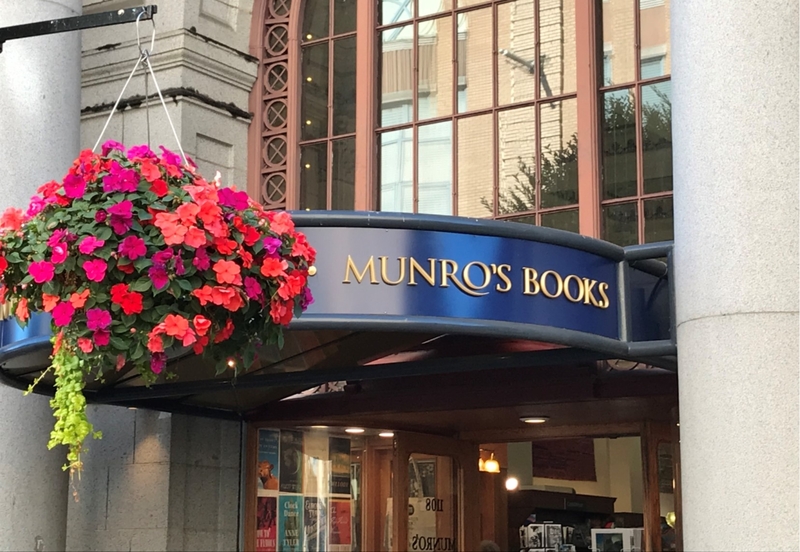 Celebrate 55 years of Munro’s and join us for our most interactive event yet! Artist Jane Mount, founder of Ideal Bookshelf, will be here signing copies of her new book Bibliophile, an illustrated collection of all things bookish. While you're here, grab some treats and flex those creative muscles as you draw your very own Ideal Bookshelf or book cover alongside Jane! And best of all, Jane will hand draw three winners’ favourite book covers, while another lucky reader will have a custom shelf drawn and sent to their home after the event. Esi Edugyan’s Half-Blood Blues captivated readers across the globe, winning the Giller Prize and earning a place on the Man Booker shortlist. Her new novel, Washington Black, has already landed a second Booker nomination for its wildly inventive portrayal of a young slave’s flight from Barbados alongside a mysterious inventor. Ambitious and powerful, it’s sure to appear on many more prize lists in the coming months. Get your copy signed by the author at this very special launch from one of Victoria's own! A beloved local artist and writer turns his eye to one of the greats this spring. In E.J. Hughes Paints Vancouver Island, Victoria’s own Robert Amos collects paintings, sketches, and handwritten letters from Hughes’ estate that show the iconic painter’s love for his island home. Bask in all things local at this very special launch.